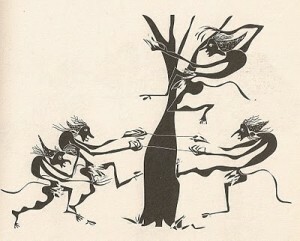 While Americans have their cute elves and parts of Eurpoe have the Tomten, parts of Greece must contend with dim-witted goblins called Kallikantzari. During the year Kallikantzari are forced to live underground. Here, they spend their time sawing away at the pagan World Tree in hopes of bringing it down, forcing the earth to collapse in on itself and basically killing us and everything we know. On Christmas morning the Kallikantzari are allowed to roam the earth, distracting them from their goal of bringing about the apocalypse. For the next twelve days they spend their time scaring humans, and being general annoyances. Greeks take various forms of precaution against encounters with the Kallikantzari. The most popular is placing a colander out on your doorstep. The goblins get distracted counting the holes in the colander, but as they cannot count above the number two, they don’t make much headway. See, Kallikantzari can only count up to two because uttering the number three, a numeral which represents the holy trinity, would result in their immediate death. In result, Kallikantzari can stand there for days counting ‘One, two…one, two…” over and over again. Did I mention they weren’t very bright? If a Kallikantzari does succeed in gaining entry into your home you can expect some aggravating and disgusting pranks. Putting out fires, rearranging furniture and and defecating in any open containers of food are sure signs you are dealing with one of these creatures. 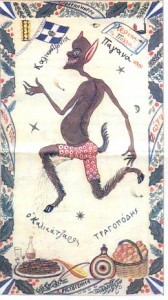 Expectant mothers have an added worry this time of year, as it is believed that any child born over the Holy Nights risks turning into a Kallikantzari. So, what did mothers do to protect their infants from this terrible fate? BURNED THEIR BABIES TOES OVER AN OPEN FIRE. If you didn’t have a baby and the smell of burning baby-flesh to worry about you could also try to keep the Kallikantzari out of your house by hanging a pig’s jawbone over your doorway. I’m sure you can make it more festive by adding some holly or tinsel or something. No pig parts handy? Don’t fret! You can have a wedding for some logs. Yes, I really did just say that. If you fashion a log from a male named tree, and one from a female named tree (because, of course you name your tress, right?). Next, conduct a wedding ceremony between the two logs, (if you do, please take photos and send them to me), then burn them in your fireplace. At least you don’t have to worry about the honeymoon. Finally, on Epiphany, the Kallikantzari are forced back underground only to discover their entire year’s worth of work on the World Tree has been for naught. The tree has healed itself in their absence and they must begin their work all over again.